Should you have a separate school room? Or should all learning take place naturally around the table or on the couch? Well, there’s no right or wrong answer to these questions. The answer is “it depends.” It depends on you, your house, your children, and the flow of your homeschool days. For me the answer is yes, I absolutely should have a separate homeschool room. Yes, very much, yes. And I’d like to make the case that having a dedicated homeschool area is so beneficial. 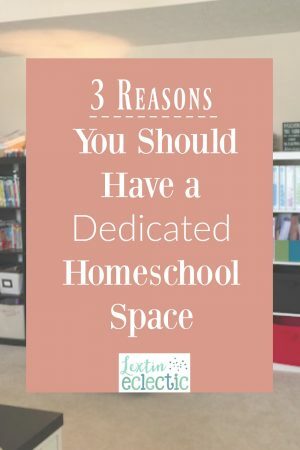 I’ll give you 3 reasons why you might want to consider jumping on the bandwagon and creating your very own homeschool space. There’s nothing quite so helpful in getting my kids to focus than when I take them to the homeschool room with me. That’s when they know it’s time to pay attention and get some things done. The school room doesn’t have toys or other distractions. Rather, it’s full of books and curricula and art supplies. Learning can happen elsewhere, but our most productive learning is always done in our school room. The room is full of bookshelves, desks, tables, benches, bean bags, and canvas tubs. Everything is carefully organized, put in colorful binders, placed on shelves, or tucked away in drawers. Guess what this means? I rarely lose stuff (yes, sometimes it still happens). But I find that I misplace things much less frequently than when I used to have school strewn about the house. It’s nice to open a drawer and know that the math book is inside or reach over to the book shelf and grab the atlas sitting there. My school room usually looks like a total disaster area. There are art projects piled on the art table amid splatters of paint and puddles of glue. The large table in the middle is usually piled high with books, curricula, pencils, marker boards, and projects. The bookshelves are full to bursting with books and teaching aids. Sometimes there are even stacks and piles on the floor. I try to clean as I go but it doesn’t always happen. I love that my mess is contained and doesn’t spill over into every other room in the house. The rest of my house can be somewhat clean and partially clutter free. If you have the space, I definitely recommend having a dedicated room for homeschooling. All of your books and supplies can stay in one place! It’s amazing! It can also help both you and your kids stay on track and be focused on learning. This means that you are crazy efficient! But what if you don’t have the space to have a separate room for homeschooling? Well, I still recommend having a dedicated homeschool space – even if that means you use the kitchen table. You can still be creative in establishing and organizing that space. Try using a separate cabinet or shelf that is only for homeschool supplies. In our first home, I homeschooled at our kitchen table but I had an amazing (and adorable) green cabinet that held books and school supplies. When we were done with school for the day, everything could be placed right back on the shelves and I could close the cabinet doors. It kept my house from feeling overly cluttered and it kept little hands out of our supplies. I’ve tried the concept of homeschooling wherever we are in the house, but do you know what happened to us? I lost everything – books, pencils, glue, and papers. I could not keep track of a single thing. Having a dedicated homeschool area has solved all of my organizational issues and it helps our homeschool day flow more smoothly. My homeschool room has changed over the years (with 7 moves), but I always make sure to establish a homeschool area in each of our homes. It is absolutely one of the best things I have done in our homeschool. If you’d like some inspiration for your own homeschool space, be sure to take a tour of our many homeschool rooms over the years! Stock your homeschool shelves with this awesome giveaway! I dreamed of having a separate home school room for the very reasons you mention! We tried it here but the only room was tiny and it was cramped and we quickly decided it wouldn't work. Our dining room does double duty. I think it is very important that you have *something* to get that sense of "it's time to focus on school" mentality. Yes! It does help to have somewhere that is the "school" area to help us focus and get our work done. I love having a dedicated space and I enjoy decorating it! I'm not sure my hubby would agree since I roped him into hanging things on the wall for me! I love the photo of your schoolroom! We have most of our "school stuff" right now in a designated part of our basement, but some days, we are at the table or on the couch. Guess it depends what we're doing, but it is good to have a dedicated space to keep books, materials, computers, etc. 🙂 Great post! Thanks! We are liking how it turned out. We do school in other areas as well – in the living room or downstairs in the kitchen. But I like keeping most of our stuff in one place! Totally agree! I have a Murphy desk in our office. The one side is my husband’s office desk and the other side is our school room. I have added my website for you to see it. Theres a post about homeschooling in small spaces. It has pictures!